The images that come to mind whenever someone thinks of grandmothers are of old ladies, enjoying a life of retirement, full of wise words and stories for their grandchildren. But 77-year-old Willie Murphy couldn’t be further away from that stereotype. Murphy, of Rochester, New York, is able to do feats of strength that are difficult for people of any age. One-handed pull-ups, one-handed pushups, and fingertip pushups are no problem for Murphy, the Mirror reports. 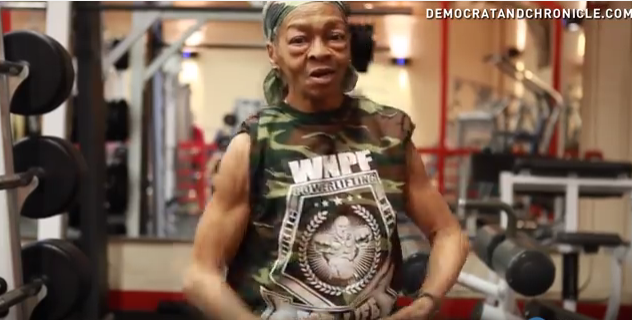 This 48kg grandmother gets in the gym and can put anyone to shame with her feats, regardless of age or gender! In 2014 she won the coveted World Natural Powerlifting Federation Lifter. Murphy started lifting a few year ago when she saw a sign at her local YMCA for a weight-lifting competition. When she asked if she could participate, an employee said, “Go for it, granny,” according to the Rochester Democrat And Chronicle.